Common Mullein (Verbascum thapsus), is a member of the Figwort (aka Scrophulariaceae) family, but Figwort is much more fun to say. Snapdragons are also a member of this family. Mulleins can grow in a wide variety of habitats — crop fields, meadows, pastures, beside streams or lakes, along roads, in clearings in the woods and in gardens. It is a drought-resistant plant and often found in dry, barren areas. It actually seems to prefer dry, sandy or gravelly soils but it will also thrive in moist soil. The one thing mulleins don’t like is shade. Mulleins are often the first plants to grow in an area after a fire or where the soil has been disturbed in some way removing anything that would shade the area. When the ground receives light, mullein seeds that have been dormant in the soil for years begin to grow. Later, when grasses begin to take over mulleins die out leaving only their dead flower stalks. The mullein was brought to Virginia from Europe very early in the 18th century primarily for medicinal purposes. It spread so quickly that Amos Eaton, an American botanist in the early 19th century, thought it was a native plant. By 1839 it was already reported as far east as Michigan and by 1876, the mullein was found in California. It is now common in every state. In years past the mullein had some very colorful names based on its appearance such as “woolly mullein,” “velvet mullein” and “flannel leaf.” There have been many names containing some variation of “blanket”: “blanket mullein,” “beggar’s blanket,” “Moses’ blanket,” “poor man’s blanket,” “old man’s blanket,” and “our Lady’s blanket.” The only ones who really use the mullein leaf as a blanket, however, are hummingbirds. They have been known to line their nests with parts of soft, downy mullein leaves. A couple of more whimsical names related to the fuzzy leaves are “bunny’s ears” or “lamb’s ear.” "Feltwort” comes from the Old English use of “wort” meaning a plant or herb and “velvet dock” or “mullein dock” comes from the British “dock” applied to any broad-leaved plant. Some names such as “Jacob’s staff,” “Jupiter’s staff” and “Aaron’s rod” refer to the description of the plant’s tall flower stalk. Mullein is biennial which means it has a two-year life cycle. The first year it grows a rosette – flat and circular, close to the ground, with large soft felt-covered leaves that can be up to twelve inches long and five inches wide. The rosette survives through winter, and the next year the flower stalk can shoot up to eight or even ten feet tall. The yellow flowers bloom from June to September but only a few of the flowers on each stalk are open at a time. Each flower is open only for a single day, opening before dawn and closing in the afternoon. The flowers will self-pollinate if they have not been pollinated by insects during the day. At the end of the second summer the plant will die but the stem will stand through the winter and into the next season, drying into a dark brown, stiff staff of densely packed seed capsules. Each plant produces hundreds of seed capsules and each capsule contains up to 700 seeds. So one mullein plant may produce 100,000-200,000 seeds in a year. The seeds can survive almost any conditions and have been demonstrated to be viable for up to 100 years. Since mullein can’t grow in shade, the seeds may lay in the soil, waiting until plants around them die or for the soil to be disturbed and the taller plants removed. Goldfinches, Indigo Buntings and a few other birds eat mullein seeds, but there are many seeds still left to grow. The mullein is legally listed as a noxious weed in Colorado and Hawaii, but the good news is that mulleins rarely become invasive. Seed dispersion is accomplished the wind moving the entire stem or by the plant being bumped by an animal. So the seeds are contained in a small area. Seventy-five percent of the seeds fall within a yard of the parent plant; ninety-three percent will fall within fifteen feet. Another safe guard to the mullein becoming invasive is that the seeds require open ground and sunshine to germinate so it is generally unable to compete with most agricultural crops. On the other hand, because of the plant's hairiness, mullein is resistant to contact herbicides and burning is only creates new bare areas for mullein seedlings to grow. Animals rarely eat the mullein because of its irritating hairs. Because of this, it can be a problem in pastures. Although, mullein plants are unable to survive being tilled, tilling does stir up dormant seeds in the soil allowing them to germinate. The best way to remove mulleins is to pull them. The mullein has a shallow taproot and comes out easily enough, but it is nearly impossible to completely remove all the mulleins from an area because the millions of seeds in the soil will continue to germinate as the soil is disturbed. 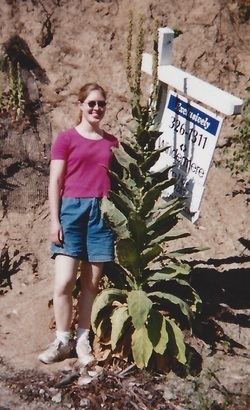 It was this endless childhood chore, day after day, that caused my dad to so dislike the mullein. One negative aspect of the mullein is that since rosettes survive through the cold weather the leaves provide warmth and protection for insects to winter over, some of which can be harmful to other plants. Through the centuries the mullein has been used to treat many common ailments. European settlers used the tea as a remedy for coughs, sore throats, bronchitis and related breathing ailments such as asthma and allergies. They made a syrup from it to treat croup and smoked the dried leaves as a respiratory stimulant for the lungs. A mullein poultice applied topically is effective in treating a variety of skin irritations such as rashes and boils. Its anti-inflammatory and anti-bacterial properties make it a good remedy for hemorrhoids and cold sores. It has even been suggested as a treatment for warts because of its antiviral properties. Other claims for the mullein is that it relieves digestive disorders, such as diarrhea and stomach pains and its analgesic properties are helpful in treating migraine pain. Mullein oil is derived from the plant’s flowers and is used to treat swollen glands and earaches. Recent studies have supported many of these traditional uses. Both the leaves and flowers contain mucilage which is soothing to irritated membranes, and saponins, which make coughs more productive as an expectorant. Research has shown that the herb has strong anti-inflammatory activity and lab studies suggest that mullein flower infusions have antiviral properties, as well. The flowers also contain compounds that kill bacteria making it effective in treating infections. It has even been used to treat tuberculosis as it inhibits the bacteria which causes the disease. It is also useful in treating fungus. Mullein is widely available in health and herbal stores and the seed is readily available from seed catalogs. There are also non-medicinal uses of mullein. “Quaker rouge” refers to the practice of rubbing one’s cheeks with a mullein leaf to produce a blush. The mullein flower was used to make a bright yellow dye, used as either a hair rinse or to dye cloth. The dried leaves and hairs were made into candle wicks or put into shoes to help as insulation. The dried stems were dipped into suet or wax to made torches. The dried stalk was also sometimes used as a spindle to start a fire. A mullein extract has been used as an insecticide for killing mosquito larvae. As far as recipes for mullein…there really aren’t any beyond medicinal use. Mullein tea is simple to make -- just steep the leaves in hot water. This tea is slightly bitter, the flowers are more sweet and can be added to improve the flavor. Strain the tea through fine-weave cloth or a coffee filter to remove any stray hairs which may cause irritation. Making an oil is also very simple. Harvest mullein flowers and stuff them into a jar, crushing them as you fill the jar. Add olive oil to submerge the flowers and stir the mixture to blend the crushed flowers with the oil. Put a lid on the jar and set it in a sunny windowsill for five days and then strain out the flowers. Put the oil into a clean jar. A word of caution: the seeds of the mullein are toxic and should never be taken internally.